Why are mine so boring? wonders Barbra K.
Check out this unique vegetable topiary for your buffet table! Serve it with your favorite veggie dip. You can make one of your very own. 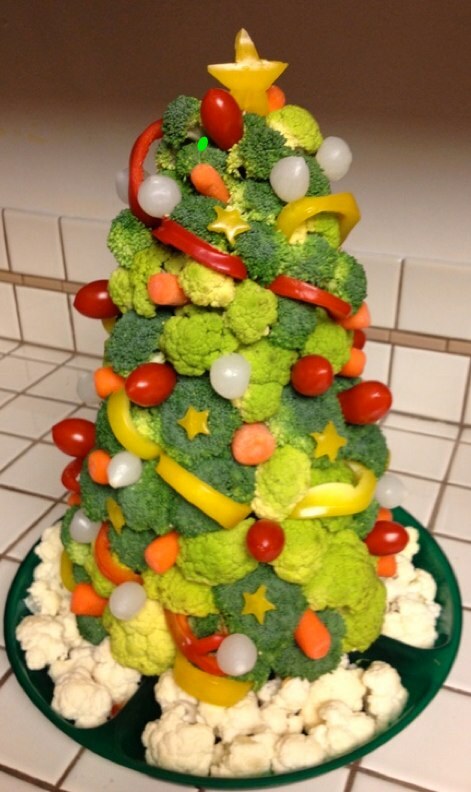 Click this link Veggie Christmas Tree to find out how! Hey EAGC Design Committee, I’m looking at you! I happen to have both juniper and crabapple trees in my yard that usually look quite beautiful. The crabapples were especially pretty this year. Not especially pretty were the orange “mushrooms” infesting my juniper. Upon investigation I discovered that cedar/junipers and apple/crabapple trees can be an unfortunate combination. Wikipedia offered some enlightening information. And yes – I did notice spots on my crabapple leaves last year. Exeter Town Center Yarn Bombed!